As a fifth grade teacher, I always found the first few weeks of a new school year to be overwhelming. In order to manage curriculum planning, day-long meetings, and classroom supplies, I shifted the responsibility of setting classroom rules to my students. Not only did it free up some of my time, doing so also gave my students more ownership of the rules, leading them to be invested in holding themselves and their classmates accountable. Giving voice and power to my students showed them I respected their ideas as we established shared values in our classroom. Just as my students created our classroom rules, students can be drivers of their school community by engaging in participatory budgeting. Participatory budgeting is a democratic process in which community members decide how to spend part of a public budget, and in schools, this typically involves anywhere from $2,500 to $50,000 of the principal’s discretionary budget. The idea started in Brazil in 1989, where it has shown positive effects, and now is used in cities across the U.S. including Chicago, New York, San Francisco, and Boston. In the latter, youth vote on how to spend $1 million of Boston’s city budget to improve their communities, and have in the past supported free Wi-Fi throughout the city and billboards displaying job opportunities for homeless youth. 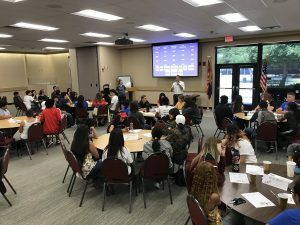 High school students from Phoenix, Arizona discuss project proposals for participatory budgeting. Courtesy of Madison Neanover, Center for the Future of Arizona. Many school districts are structured as a top-down governance model in which decisions are made at the district central office and trickle down to the principals, teachers, and students. This model creates dissonance between decisions and the needs of a community. In participatory budgeting, decision making begins with students and forces a response moving up the hierarchy. Empowering students could cultivate a strong school community, invest students in decisions, and promote a collective effort to improve student experiences. In our current state of political division, distrust in government, and declining knowledge of civics, it is imperative to promote civic engagement in schools. Civic engagement is more than knowing the three branches of government (many Americans don’t) or how a bill becomes law. Civic engagement requires learning competencies and participatory values that foster an engaged citizenry. Research out of Arizona State University found competencies like public speaking, negotiation, conflict resolution, and budgeting are all taught through participatory budgeting in schools. Students learn to be open to new ideas, participate in robust debate, and recognize the importance of listening to others. As schools place civic education aside for other priorities, participatory budgeting can help fill the gap by building democratic skills and values. Our democracy depends on it. Participatory budgeting involves many aspects of school that students find fun. My fifth grade students loved using their creative minds to craft solutions to complex problems. Classroom debates gave my students the opportunity to argue their points based on evidence and reason. Voting on classroom rewards invested them in the academic and social goals they were working towards. (Though be wary that students may vote for messy rewards such as pieing their teaching in the face — see below.) In a time of political division, it is easy to forget how fun democracy can be. If more schools tried participatory budgeting, it could show our nation’s students the joy of democracy. 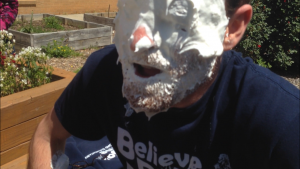 My students pied me in the face as their classroom reward. Participatory budgeting is not a silver bullet. Implementation requires thoughtful planning, school and community buy-in, and principal autonomy to use discretionary funds as desired by students. Students should be supported and coached throughout the process just as they are in their classes. Resources are available to help school leaders get started. With strong implementation, I believe participatory budgetings’ potential to empower students, promote democracy, and create fun is a win-win for students, schools, and our nation. Let’s flip governance on its head and empower students to create positive change in their schools. This entry was posted in Education Governance, Education Innovation, Education Policy, School Funding, School Governance, School Leadership and tagged Bioscience High School, civic engagement, democracy, participatory budgeting, school budget, school finance, school governance, student voice, Youth Lead the Change on May 10, 2018 by Andrew Frank. Can You Name the Branches of Government? Most Americans Can’t. Today is Constitution Day, a holiday commemorating the formation and signing of the U.S. Constitution on September 17, 1787 — 230 years ago. As “a nation of immigrants,” America’s national identity is largely tied to our founding documents, endowing the Constitution with a unique importance in American culture. However, many Americans know little about this document that we are supposed to support and defend. Last week, the Annenberg Public Policy Center (APPC) of the University of Pennsylvania released its Constitution Day Civics Survey, with dismal results. 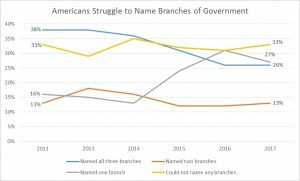 Only one in four respondents were able to name all three branches of government, a 12-point decline since 2011. Shockingly, 33 percent could not name a single branch. The survey also asked respondents to identify which rights are guaranteed by the First Amendment. While nearly half (48 percent) were able to name “freedom of speech,” only 15 percent could name “freedom of religion.” Even fewer respondents identified the other rights (freedom of the press, right to petition, and right of assembly). Thirty-seven percent couldn’t name any. Perhaps, in prior years, this warning may have seemed overblown. But in the Trump era, amid a seemingly constant slew of anti-democratic rhetoric, it feels right on the nose. For example, when asked whether those who are in the country illegally have any rights under the Constitution, 53 percent of APPC’s respondents disagreed. In this context of widespread ignorance and misinformation, the United States has seen an uptick in hate crimes associated with the rise of President Trump, beginning in 2015, persisting into 2016 and 2017, and culminating in the violence of the “Unite the Right” rally of white nationalists in Charlottesville last month. Luckily, some states are taking action to bolster the civic knowledge of their students. For example, over the past three years, 17 states have adopted a “citizenship test” requirement for high school students. In eight of those states, students must receive a passing score on the test to receive a high school diploma. The questions are drawn from the the United States Citizenship and Immigration Services (USCIS) naturalization civics test, which immigrants must pass to become legal U.S. citizens. This is a good first step, but it is far from sufficient. The test is not designed to be a high school civic literacy exam. It sets a low bar, with basic multiple-choice questions that ask test-takers to identify one branch of the government, or know how many amendments have been made to the Constitution. The simplicity is reflected in the initial test results, with very high passage rates and few students failing to pass the test after repeated attempts. However, such a test is only one tool available to policymakers. They can design and administer higher quality civics assessments; implement robust standards and curricula for civics instruction; and provide real-world, project-based opportunities for students to learn about government and civic engagement. For example, New Hampshire passed legislation in 2016 requiring a civics test. But, rather than simply implementing a citizenship test for high school students, the legislation allows for the creation of locally developed assessments that can include a broader range of questions. Additionally, the state created a recognition for students who pass the required test by authorizing school districts to issue civic competency certificates. If America wants to protect our constitutional rights and democratic ideals, we must ensure that our next generation of citizens are knowledgeable and engaged. That starts in the classroom. This entry was posted in Education Policy, Federal Education Policy, State Education Policy, Student Assessment and tagged annenberg public policy center, Civics, civics education, Constitution, Constitution Day, democracy, Donald Trump, education commission of the states, government, president trump on September 18, 2017 by Phillip Burgoyne-Allen.